Have you ever been attacked by a COCONUT FREAKS? When you own such a rare palm and when or before it fell down, it is possible to take separately each of the branch, cut two third of the existing leaves and replant in the soil with good watering and shading. New roots will appear on the stem. Please avoid to loose a so precious coconut freak! Branched coconut - Two branches. Branched coconut - 14 branches coconut palm from Maalhos island, Baa, in Maldives. 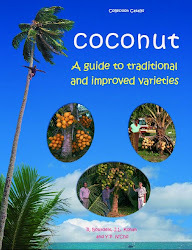 The Cook Island "Seven in one"
Normal coconuts have 3 eyes, no less, no more ! 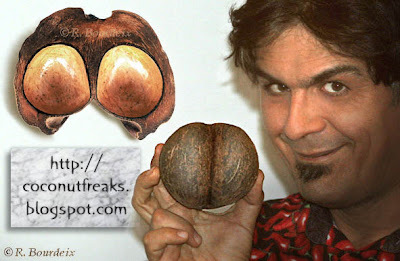 Coconuts with 3 and half "eyes"